Designed for PhD’s, Academic Career Series will provide a series of panels and presentations addressing key elements of the doctoral process and the academic job search. Faculty will present on defending, academic applications and the interview. To register for all events, workshops and to view job postings go to myFuture . You have access to our services for up to one year after graduation. Use us, we want to be useful. You managed to write that thesis and now it boils down to your oral defense. Find out how to impress your committee, avoid common pitfalls and enjoy your moment of glory! Often, once an individual receives a coveted job offer, the hard work really starts. Negotiating the tenets of a job contract can be a stressful and daunting experience. There are a number of reasons that people are unsuccessful in negotiations or even fail to negotiate. In this presentation, I will use an interactive format to give attendees a head start when faced with job negotiations. The focus will be on learning some basic concepts in negotiation as well as how to overcome some of the barriers to successful negotiations. 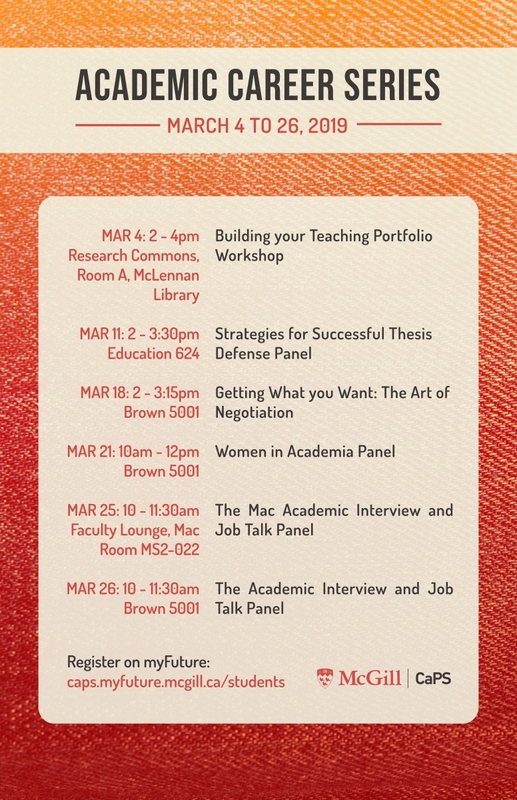 This panel will focus on the academic career paths of 3-4 women in academia/research. The panelists will share their own career trajectories including challenges and successes, and they will also speak more broadly about working in academia, including tips for navigating a competitive and male-dominated field, how to respond to illegal questions during the interview process, and how to navigate sensitive issues in academic hiring. Hear what faculty have to say about the academic job market, get tips on the application process, how to best position yourself to get interviews and job offers, and what to do if your luck is running out. The format will be brief presentations followed by a Q & A.